While things may seem quiet here right now, rest assured that the Hysterical Publishing team and I have got our shoulders to the wheel and our noses to the grindstone preparing Here Comes Your Man for worldwide release. From the beginning, the self-publishing task that scared me the most was the page layout. I've designed a number of flyers and newsletters over the years, but never anything close to this size—89,134 words spread over 352 pages. I'm glad to say that I've now crossed the layout task off my list. 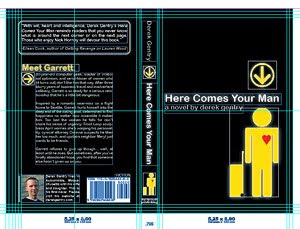 On Tuesday, I uploaded the exterior and interior files for Here Comes Your Man to my printer and ordered a proof of the paperback. As you might imagine, I'm pretty excited to see this prototype when it arrives next week, but I'm also relieved to have someone else babysit the little monster for a few days. I've told Eileen that I'm going to print her blurb on a t-shirt that I can wear when I need a boost, but honestly, visiting her blog usually has the same anti-depressive effect without adding to my laundry pile. I also just finished reading Eileen's latest teen triumph, Getting Revenge on Lauren Wood, which I highly recommend, whether you're actually a Young Adult or just recall what it was like being one. In my favorite development thus far, my daughter Lilah agreed to take my author photo for the back cover of Here Comes Your Man. Though our travel budget was limited, we still managed to shoot in several exotic locales, including the dining room, the playroom, and the front and back yards (the latter being quite dangerous because of the giant spiders reputed to live there). Spiders aside, Lilah and I make a pretty good photo team: since she's only 4' 3", all of her shots make me look tall and powerful, and she never fails to make me smile (yes, that's a smile you see there). She also works for free (as long as you're willing to feed her, clothe her, and put her through college). If you keep building up the level of excitement like this I think my head is going to explode! I was feeling reasonably calm & collected about the whole thing until I logged in this morning and saw the message "Proof has been generated." Just practicing...I knew Derek when he wore those foolish soccer shorts and and knee high socks and we were all a bunch of geeks running around the soccer field. (I was wearing jeans! 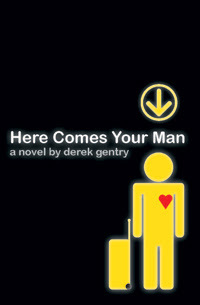 )This sounds so cool Derek,congrats on the Proof! And great photo. Many author photos are taken by wives, and yet this is the first I've seen by a daughter. 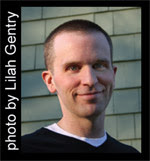 And yes, one of the things I learned about portraiture is if you want to make someone look important, shoot up at them. And no one can deny the look of pride in your eyes. Thanks, Steve! Lilah's involvement has been hands-down my favorite part of this whole book project.